Jumpcat does not this disappoint its name. In Jumpcat, you well, Jump a cat! And come on, don’t say you have never wanted to jump a cat. I’m pretty sure we all have every now and then! 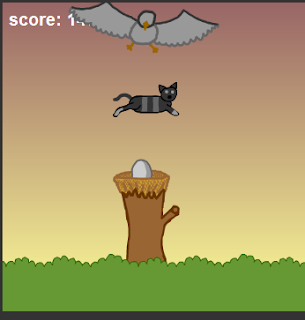 Jumpcat offers all the control schemes you could want and plays nicely. You get to dodge all of a cat’s normal everyday obstacles: rocks, trees, rolling boulders, helicopters, missiles, ECT. And you thought it was easy being a cat! No wonder they seem to sleep 23 hours a day (This is what they do the one hour a day they actually move!). The real trick in jump cat is getting to the 1000 point combo bonus and staying there. There really isn’t much to say about Jumpcat, and I’m running out of bad puns, so go play it!....NOW! It runs nice and smooth, controls great, and is pretty addicting! It has decent background music, and has the few sound effects the game needs. Jumpcat doesn't go out of it's way to impress you in the sound department, but does everything it should! Not much to say, the art is pretty good, and there really isnt much to ask for other then a deeper background. You jump a cat, over helicopters. 'Nuff said. Jumpcat has every type of control you could want. I like cats, i like jumping. And Editundo was one of my first friends on Kongregate, so there!